The ultrasonic energy is created within a liquid by means of transducers, which convert electrical energy into acoustic energy. These transducers are similar in function to a radio speaker except they function at ultrasonic frequencies (40,000 Hz) and transmit acoustic energy to a liquid rather than to air. The transducers consist of vibrating elements (piezoelectric disc) bolted between thick metal plates. The transducers are bonded to the underside of the tanks containing the cleaning liquid or are encased in stainless steel for immersion within a liquid. For reliability, many transducer modules are uniformly distributed over the tank bottom rather than having a single transducer in the center of the tank working very hard. An electronic generator energizes the transducers. The generator transforms the electrical energy from the wall outlet into a suitable electrical form for efficiently energizing the transducers at the desired frequencies. All ultrasonic cleaning systems consist of the four fundamental components; transducer, generator, container for liquid, and cleaning liquid. The performance and reliability of the system depends upon the design and construction of the transducers and generators. The overall effectiveness of the cleaning is dependent upon the cleaning liquid. The size of the tank is dependent upon the size or quantity of the parts being cleaned. The number of transducers and generators is determined by the tank size. The choice of cleaning liquid depends upon the parts being cleaned and contaminant to be removed. 1. Reply your enquiry in 10 working hours. 3. OEM and ODM is available. Industrial ultrasonic cleaner are suitable to clean irregular and complex specialized instruments,components and PCBs of sundry shops,workshops,factories etc. 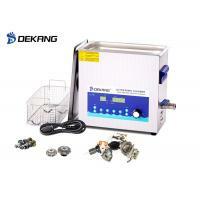 How to use DeKang ultrasonic cleaner ? 1. Fill the stainless steel tank with cleaning solution; Plug the power lead into grounded outlet; After power-on, the temperature displays the actual environmental temperature, LED displays 3 minutes (default ultrasonic time). 3.Temperature setting: Press “temperature-/temperature+”shortly at a time means time increase or reduce 1℃ at a time, press and hold there means time will increase or decrease by 10℃ . Usually, the best cleaning temperature is within 40℃ to 60℃. 2.Time setting: Press the “TIME-/TIME+ ”shortly at a time means time increase/reduce 1min at a time, press and hold means time will increase/reduce by 10mins continuously. The cleaning stops when the timer counts down to 00:00. If the unit needs to be stopped before the timer runs up, press “Ultrasonic” button. 4. After time and heat setting, press “Heating” or “ultrasonic” button to start both function. Press “Heating” button again, the heating function will stop. The same for Ultrasonic Function. 6. Drain: press the “drain” button to open or close the automatic valve. The automatic valve will close a certain time (10 minutes in default) later after drain. 7. Empty the tank and clean both the outside and inside of the cleaner with a clean and dry cloth for next use. NOTE: Do not pour water out until it’s cooling, Hot water will hurt you and damage the machine itself. 3 days after confirm the payment ,Express Including YOUSU,UPS,DHL,FedEx,Air transportion,Sea transportation,Also you could ask your courier to pick the goods. Q1. Are you a factory of trading company? We are professional manufacturer.We are warmly welcome clients from worldwide to visit our factory and cooperation with us. Q2. Can I get some samples? Yes,we are honored to offer you samples of most products. Q3. Can we print our own brand for the fixtures ? Q5. What certifications does the product get? Q6.Is my own forwarder available to transport the products for me? Yes,He can ship the products for you if your own forwarder is in Shenzhen. And then you won't need to pay the freight to us.